I've found many webpages about the same issue, some older some newer, but I can't find a clear and updated method to fix the purple/green fringe in Raw highlights (and perhaps a little general color cast in MLV files from 5D3). 4. ACR method appears to be that "clean" solution: it's simply based on Remove Chromatic Aberration option (Lens Corrections tab) and it works BUT only in ACR: importing the fixed ACR-DNGs in Resolve, the fringe is still there! as if the ACR corrections are NOT visible in Resolve (even exporting the original DNGs to new ACR-DNGs). Now, considering that I need to use Switch (for MLV to DNG conversion) which is the cleanest method that fixes the purple/green fringe AND lets me grade in Resolve? 1. In Switch mlv_dump, if you DON'T select the option (07) disable vertical stripes in highlights, means that Switch DOES fix the vertical stripes, right? 2. Time ago I had installed an old Switch. Today I installed Exiftool. Then I downloaded the updated Switch for overwriting the old one. Only at this point I read that Switch uses Exiftool, so my question is: could this 2 installations (Switch and Exiftool) be in conflict? Should I uninstall Exiftool? Hi reddeercity, thanks a lot for your fast reply! -Once converted in DNGs with MLVProducer, the footage in Davinci appears completely wrong in temperature and tint and luminance... why? I must admit that I was pretty happy with Switch (BUT the fringe issue) and it would have been perfect if ACR corrections would remain visible in Davinci... Nobody knows a way to export ACR corrections in a way they are visible in Davinci? I can't use MLVFS because I use an Hackintosh (it means less compatibility with some piece of software, for example RAWMagic) and when I tried to install MLVFS (time ago) it crashed. There's a setting for chromatic abberrations in Mlv App, heard a lot of good things about it. That is you are exporting to prores otherwise acr through ae should work best. Note that Switch can export ae project files(cdng to prores) with a template working through aerender. Hi Danne, thanks a lot for your reply. Actually I'm not interested into Prores (at least until we'll see new raw version in action) nor in After Effects. My current work is strictly linked to Davinci AND dng-files. -ACR-defringed-DNG in Resolve (with visible ACR corrections). Nobody knows a way to do it? That will not work without an intermediate file such as tiff, prores etc. If you're using ACR, you can load LCP profile, IIRC. This would be the most accurate solution, since it's based on calculations of your lens. Here is a tutorial for creating custom profiles. But: the magenta cast in midtones is also affecting my images (on 50D MLV) and I can't solve it. Andy600 gave me some hints, but I couldn't fix it. I don't know if I'm too dumb on color grading or something is wrong with the MLV itself. 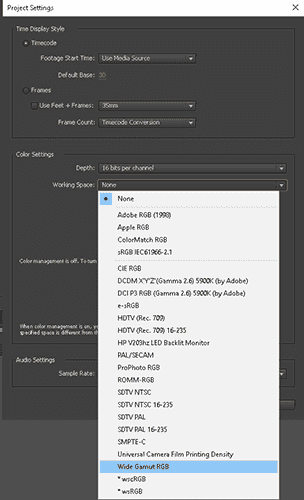 edit: you can import CDNG on Resolve and used the lens correction feature, it seems. Hi reddeercity, thanks really much for your reply. Unfortunally, for some reason my Hackintosh has compatible issues with various software: for example FCPX can't work at all, Rawmagic crashes, Isadora crashes, and all virtualization software as well (VirtualBox, Parallels, etc.) The reason... I don't know: perhaps the specific hardware, or the OS installation... I really don't know. Anyway it's not a great problem: I don't use FCPX, and all the software in my workflow work fine. Anyway, tell me, in your experience MLVFS does some defringe or CA correction? It operates automatically? Ok , not sure about defringe , here the first page . or the nightly built you use , have to try just the plain Vanilla build ? How do you normally process you Cdng's ? you work flow , resolve ? A.E. ? do you use a intermediate ? Prores ? Sorry, what is this all about? 5 years ago gone bug in DR, or lens artifacts, or what? Can you please share one DNG? I think (I hope...) I solved it. First of all, the fringe in my case is lateral chromatic aberration caused probably by various things: anti-aliasing filter in 5D3, lens (Tamron 24-70), filter (Hoya UV), etc. and it's visible in highlights/contrast edges. ACR manual Defringe is fanstastic and does perfectly the job, so one workflow could be MLV-to-DNG (Switch), then DNG-to-TIFF (ACR with Defringe), then grading TIFFs in Davinci (but losing RAW tab). At this point the great question is: what is better, losing RAW tab for working with perfect TIFFs, or trying to solve the fringe directly in Davinci and enjoy the flexibility of Raw tab? As I wrote, Nick Driftwood method works but in my opinion is not clean actually. 5. After the Layer Mixer one last node with denoise (in my case Luma 2 and Chroma 10). Basically this method mainly adds Qualifier (and noise reduction) to the old Nick D. method. The result seems to be very near to the ACR quality. Thank you so much 50mm1200s!! !